Kasol in the midst of Parvati Valley is a trekking paradise in Himachal Pradesh. 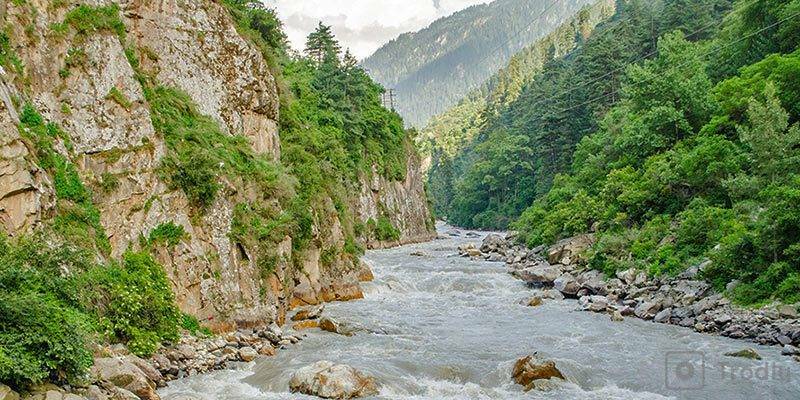 Kasol offers an experience of lush green valleys with the elegant Parvati River flowing alongside like a pearl necklace. Trekkers and nature lovers from across the globe visit this place. And surprisingly many of them choose to stay. Kheerganga trek happens to be the most popular of treks in Parvati Valley. They get shackled to the beauty of Kasol. The number of Israeli settlers shows you the value Kasol holds among foreigners and Indians alike. This place is heaven. 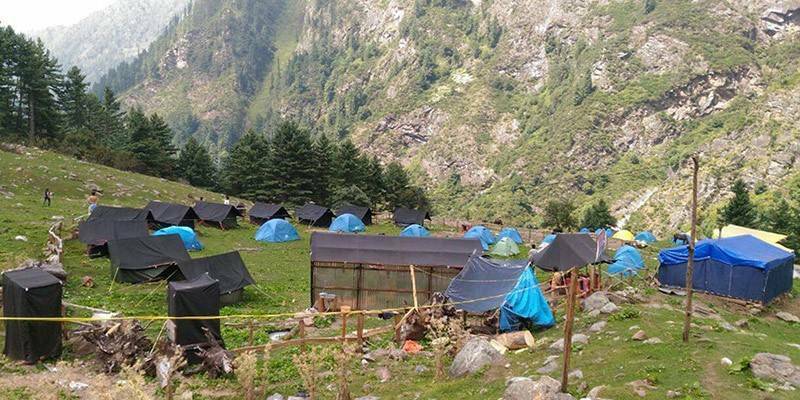 Although due to court order there has been a recent clamp down on number of commercial camps operating in Kheerganga, its popularity has hardly been dented. The Tosh village, hot springs of Manikaran, Kheerganga, Parvaty River almost anything and everything here is filled with serenity. 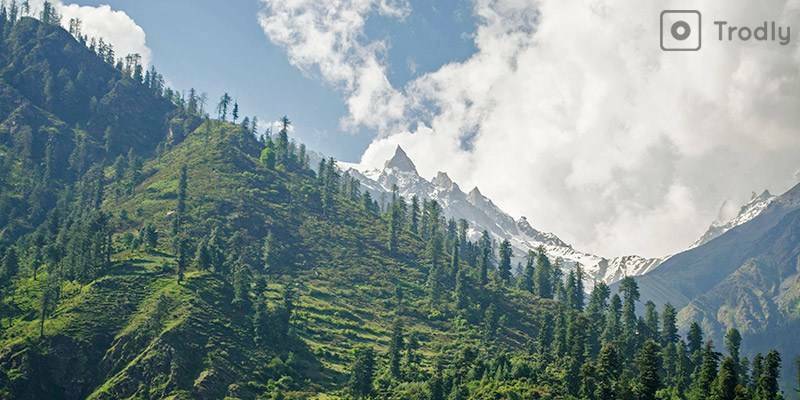 During the treks from Kasol you will get to see raw nature thriving in the valley. Kasol and nearby villages like Tosh and Malana are places where people live by respecting Nature. Nature is not bullied by humans in here, they co-exist. Take a break away from the sins of city life and spend some time in this valley. Numerous waterfalls, hot spring pools, snow covered peaks all around and lush green forest makes Kasol and Parvati valley a gem of a holiday destination especially if you are interested in adventure. You will soon realise how Nature can be embraced if you get to know it in its true and original state. How to reach Kasol and Bhuntar? There is no direct bus or rail connectivity to Kasol from Delhi/Chandigrah. 31 Kms from Kasol is Bhuntar Airport near Kullu, which is the nearest airport that connects Kasol to the rest of the world. Buses to Kullu/Manali follow Delhi – Chandigarh – Mandi – Bhunter route. You would need to get down at Bhuntar. Bhuntar is a town, 5 Kms before Kullu from where a road diverges for Kasol and beyond that Barshaini. You get regular bus services to and fro to the town of Kasol from Bhuntar. Buses are operated both by private and government owners. From Delhi, you can board a bus from ISBT Kashmiri Gate, R K Ashram Metro Station and Majnu-ka-Tila. You can book them quite easily online. Unlike other state run bus services, HRTC buses are the best in punctuality. Keep in mind that, buses from Bhuntar to Kasol may not be available at odd hours in morning. Ask your bus driver/conductor to drop you at Bhuntar bus stand few kilometres before Kullu. Joginder Nagar (145 km away) is the nearest railway station from Kasol, which is narrow gauge. Pathankot is the nearest railway station available broad gauge wise. The actual trek starts from Barshaini, the last motorable point in Parvati Valley, 16 Kms from Kasol. Trek operators arrange transport from Kasol to Barshaini. Barshaini is last road head on this route. If God lives here then Kheerganga (Khirganga) will be his seat. This valley is the crown jewel among all the other treks around Kasol. Kheerganga is the most popular of Kasol treks. It’s a 7-8 hour hike to the hot springs located at a height of 2950 mts. or 13,000 ft. After dealing with the gritty terrain, you will reach the hot spring of Kheerganga. Take a dip in the warm water and all your worries and ailments will be washed away! The trek starts from Barshani. We reach Barshani by road from Kasol. The actual trek to Kheerganga starts from there. A path diverges from Barshani towards Tosh village, 3 km from Barshaini. 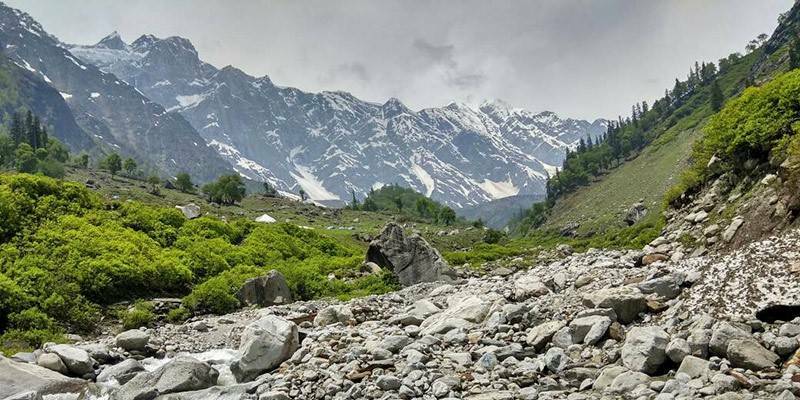 A day hike to Kheerganga is possible but not practical or advisable. If you are an expert trekker then certainly you can go for it, just start early enough. Total Kheerganga trek distance is 12-13 Kms regardless of the route you take. Barshaini is a small village with a taxi stand, few very basic stay options and dhabas. A barely motor-able road diverges from here to Tosh which is little over 2 Kms from Barshaini. A hydro power project is under construction here which has affected the beauty of the place. Hopefully a lot of it will get restored once plant is commissioned and a reservoir is formed. 1) From the bridge at Barshaini, go right and hike up to Kalga village. This route passing through dense forests is slightly longer but offers easy climb and is suited for beginners and occasional trekkers. 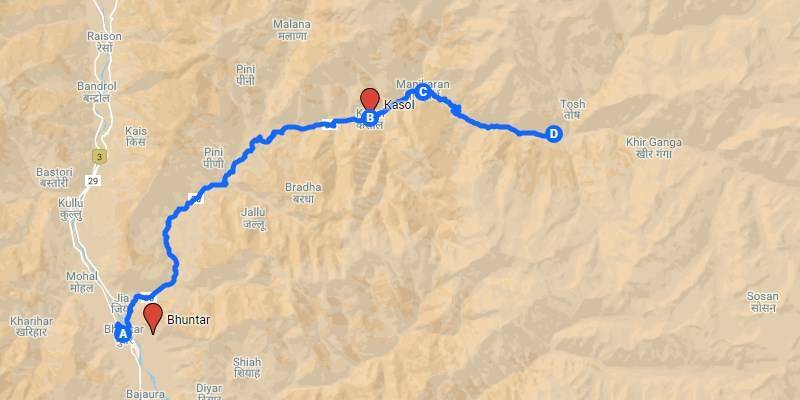 2) The second route goes via Nakthan village and you have to take a left from the bridge at Barshaini. This is the shorter route and more scenic route but quite steep at places so is a difficult one. 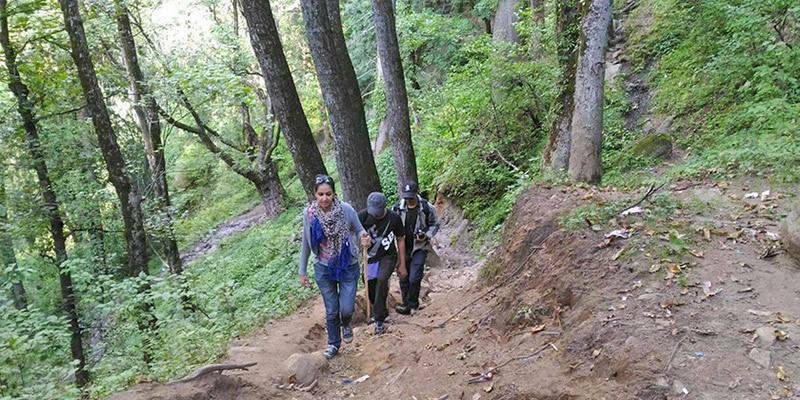 This Kheerganga trek route is moderate but not recommended for people with heart conditions. If you start your trek from Barshani in the before noon then you reach Kheerganga by sundown where you camp here for the night. Kheerganga is not a village but you can find makeshift stays and camps here. Since there is no electricity, some stays offer tandoors in dining tents to keep you warm. Transportation is hard and there is no electricity. Camps and other establishments work on generators so staying and getting good food can be quite expensive. Make sure you book your trek with an experienced operator so you get good service while you are here. As per recent court order commercial permanent camping structures are not allowed here temporarily. As an alternate Rudra nag, few kilometers before Kheerganga acts as over night camping spot. At Kheerganga there are many cafes and tea-houses and of-course a natural hot water spring called Parvati Kund. Last bus from Barshaini to Bhuntar leaves between 2 to 4 pm. Check at the taxi stand or a dhaba for exact timing. At Kasol you will find a street dotted with restaurants serving foreign cuisines, most of them will be Israeli. The increasing number of tourists from Israel is the real reason behind popularity of Israeli cuisine. You could also find German and Chinese restaurants. Be brave and have your breakfast from Israel, lunch from Germany and dinner from China! You won’t regret it. Put on your jacket, step into your trekking shoe, grab that trekking pole and start your journey through the valley where God himself finds hard to leave. One reason why Kasol and Kheerganga Trek is so popular is its almost year-round accessibility. Apart from few weeks of peak winter season, Kheerganga is accessible most of the year. During monsoons, Kheerganga trek does become difficult. Still trail remains open to experienced trekkers. Best time for the trek is April to November where absolute best months are April/May and September/October. Is Kheerganga trek open now? There have been some doubts on Kheerganga trek being operational or not after the government order. The trek is very much operational and not banned. Yes overnight camping at Kheerganga is not offered by most operators now and Rurdranag near Kheerganga acts as overnight campsite. There has been no affect on the beauty or experience of this trek. You still visit Kheerganga but its a day hike. Camping experience is also still the same amongst pristine natural beauty under the stars in Himalayas. Trek remain operational in December and January also now since camping is not happening in Kheernaga now. On day hike trekking is done to Kheerganga and if weather condition is very bad then it done to the point where its possible. Kasol is the heart of several incredible treks. 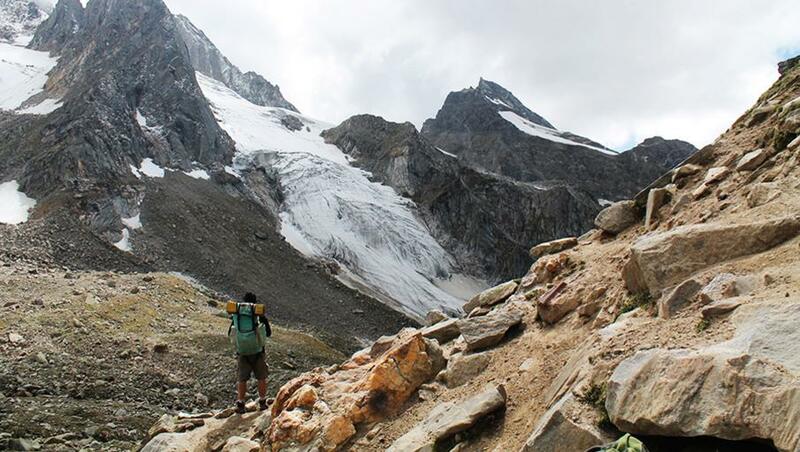 There are almost five world-famous trekking destinations which start from Kasol. Almost all them will help you get enlightened! The meadows of the Chandrakani pass, psychedelic village of Tosh, mystery village of Malana, it is a place where you can set your tent and explore all those nearby amazing villages. If not that then you can spend a night camping alongside the Parvaty River, which makes sure that the entire village hears her roar all the time. When you reach Tosh the mighty Himalayas clad in snow will be staring down at you. From the heights the village of Tosh will be like an obedient grandson below it. There’s nothing but giant pine trees and green meadows here. The village will give you a sense of calmness and peace. The friendly villagers and cool climate will break your heart when you leave. 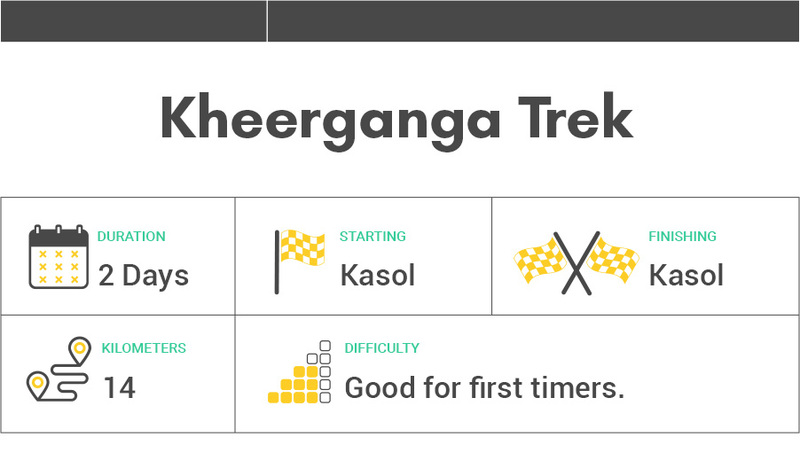 You can plan for Tosh trek or you can continue your trek from Kheerganga to Tosh. If you are interested in the latter then you trek a day from Kheerganga and you will reach Tosh by dusk. After spending a night at the local stay you can wake up next day to explore the village and get to know a unique culture this place hosts. 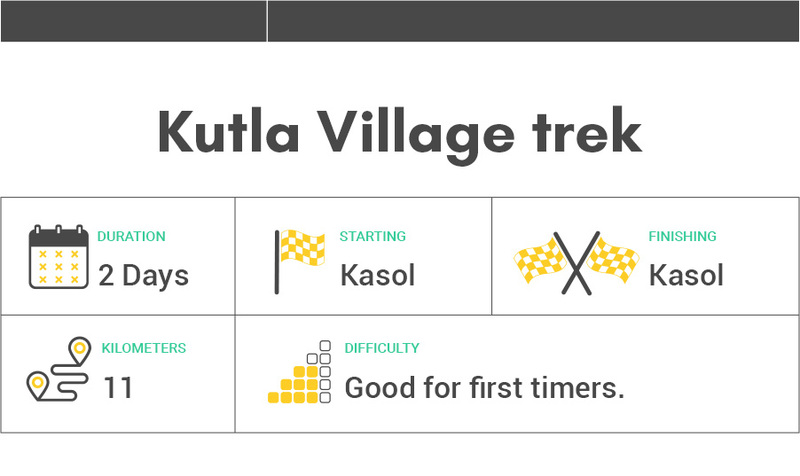 Kutla is an offbeat village where you could enjoy the raw nature and peace amidst the mountains. A two-hour trek through a narrow trail from Tosh will unravel into the green meadow of Kulta Village. It is surrounded by the snow-covered Himalayan peaks looking down at you. This village is like a treasure Himalayan peaks hid for their eyes only. But spare some sweat and enjoy the fresh air and splendid views of this unexplored beauty all for yourself! If you want to hit the path less taken around Kheerganga and Kasol then Buni Buni Pass is a great option. 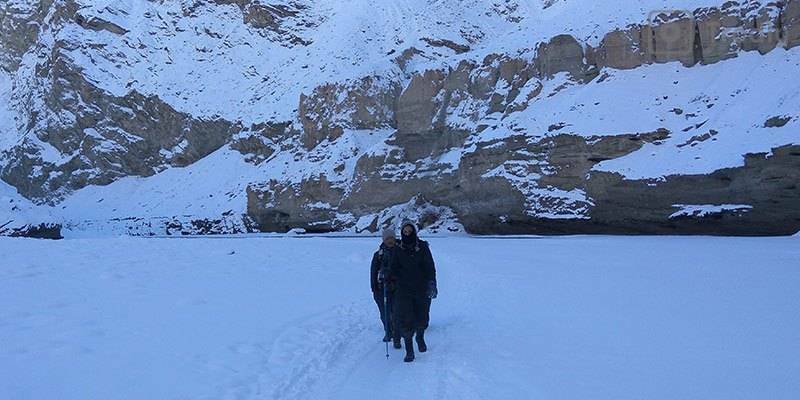 It is a further few hours trek from Kheerganga and there is a good chance in early winters and summers to still find snow here while there is none at Kheerganga. During the trek to Buni Buni Pass, you hardly find other trekkers on the trail and there would be no more crowds at the camping spot also. The trail of Kheerganga and Buni Buni Pass Trek passes through the dense forest but then leads to vast open expanse offering a great view of Parvati Valley below. 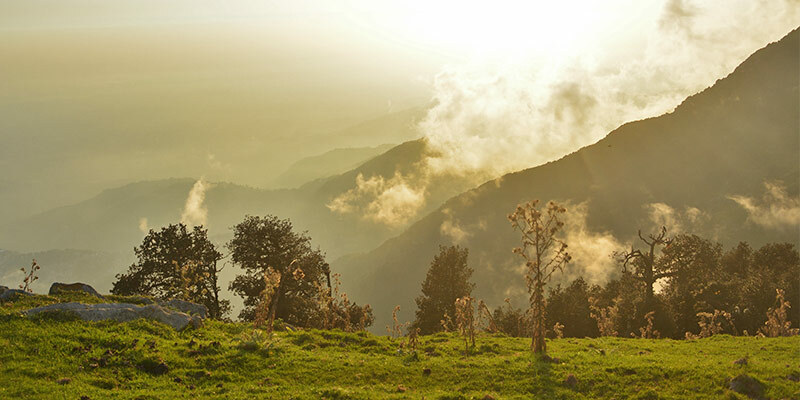 This is the trek to take if you are looking for some serenity in the hills of Himachal. 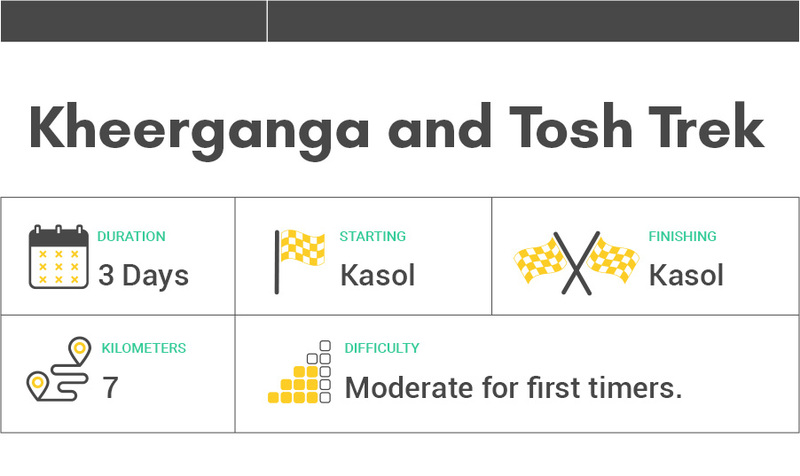 How difficult is Kheerganga trek ? Kheerganga trek is moderate trek under normal conditions. Its not a cake walk by any means. At approx 14 kilometers distance, the trekking distance during single day is also not less. But the gradient of the trail is not too steep and if you start on time you can easily cover the distance before evening. During winters and monsoon season, conditions do get little difficult which make it slightly harder than usual. But if you well prepared right clothing and gear and things do become easy. 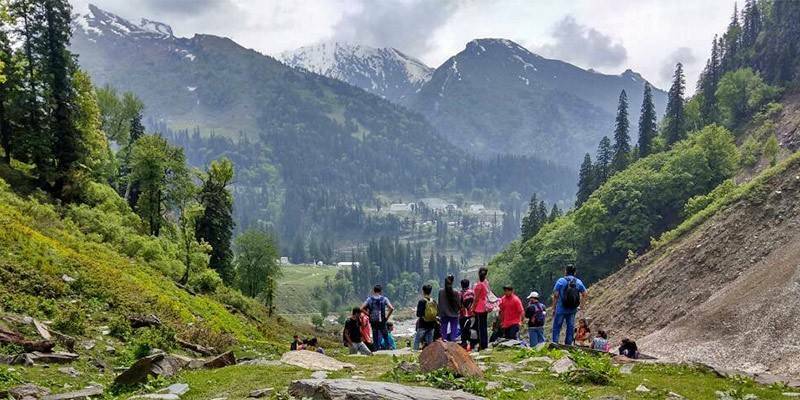 How to prepare for Kheerganga trek ? Being ready for expected conditions is the key to any successful trek. As this is an easy to moderate trek, you just need to be in good physical conditions to complete this trek. Success rate of this trek is quite high. Most people who start the trek finish it. If rains are expected, make sure you are carrying a rain coat and extra socks. If cold weather is expected in Kasol region you should carry warm woolens and jackets. Whatever the weather, proper trekking shoes are always advisable. Kheerganga can be cold even during summer months you must carry warm clothing in your backpack. Also carry a poncho or a raincoat during and near monsoon season. You can also carry it in other seasons as it always good to carry rain protection – you never know when it may rain in mountains. You can also carry thermal inners, extra pairs of socks, cold cream, lip balm and sun protection. Headlamp or a torch is always handy. A hat or cap is a must have item in your rucksack as it can get quite sunny on the trail. Track pants are always way more comfortable than jeans. Although the trek itself is easy you still need trekking shoes as most of the trail is rocky. Basic cost incurred in this Kasol Kheerganga trip would be on transport, food, stay at Kheerganga and guide services. Food, stay and guide are all included in most Kheerganga trek packages. Volvo bus tickets from Delhi to Bhuntar cost approximately 2200 return. Trek cost varies from rupee 1500 to 3000 depending on operator but inclusions and quality do not vary much. Food in Kasol and especially Kheerganga is expensive. While most meals are included in any Kheerganga trek package, you might have to pay for lunch. So a 2-3 Kheerganga and Kasol trip will typically cost you between 3800 to 4500 Rupees. ATM in Kasol and Parvati Valley are very often out of order or cash especially on long weekends. So it is best to carry enough cash. You can withdraw from your start location or Bhuntar/Kullu. If you are reaching Bhuntar very early in the morning then public transport will not be available. Getting a private or shared taxi will also not be easy. Best would be to wait at bus stop itself till day breaks. You can also make prior pick-up arrangements with a local operator. Always check weather forecast a day before leaving and pack your items accordingly. 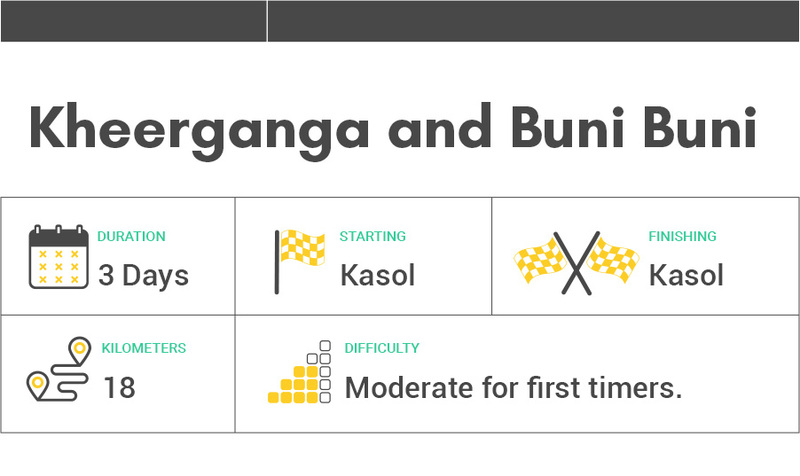 This also helps to be mentally prepared for what to expect on your journey. If you have extra time in Kasol then visit Chalal or Malana village. Manikaran Gurudwara can be visited on way back from Barshaini.